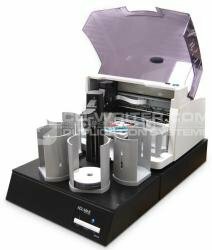 CD-writer.com is currently running a massive sale across the most popular items. We know sometimes it’s hard to appreciate the value and the saving when you are just looking at a price so we have taken a moment to put together this post in order to help quickly explain some of the products. StorDigital PrintTower: The tower duplicator that copies and prints. 3 Target LightScribe enabled DVD and CD Duplicator that copies and prints. In a nutshell this is one of the best deals on our site. We’re shipping fully LightScribe enabled units without any extra charge. So for a limited time any customer looking to purchase one of our premium range duplicators is advised to take a look at the LightScribe version. After all the Print function is shipping for FREE!!! 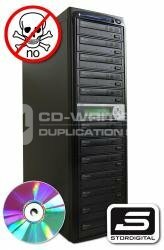 Acard DVD CD Duplicator with 160GB Hard Drive and PC control via USB. Basically we are running this stock down at a clearance price. 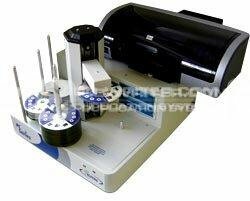 It’s a top spec duplicator at an economy price. The ACARD controller means you get good all round reliability. The units are populated with the latest Sony Burners. The on-board hard drive means the duplicator is more stable and will copy faster than a device without a hard drive. The special USB PC connection means you can drag and drop disc data without first having to create a master. A great duplicator with top specs at a stupidly low price. Our 15 target premium duplicator is a disc producing power house. Built into our high quality matt black premium cases, the SD15 features the latest high speed pioneer DVD CD burners. Customers can also choose from 160GB or 250GB Hard Drive. This price has been slashed for April, and what’s more it ships with a FREE external DVD burner on USB. No other duplicator in the market offers a faster throughput or a more stable duplicating environment. 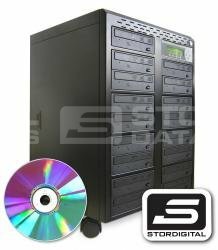 The StorDigital SD15 is built for users who want to produce a great many discs in the fastest possible time. Once again the April price cut frenzy has taken hold and we have reduced the buy prices of our most popular automated disc copying solutions. With capacities from 30 to 1000 discs our range of high quality leading technology automated duplicating solutions are unbeatable in terms of quality and price, and represent the best value in the market place. No other company in the UK has better products or lower prices on such a wide range of products. This is a one time opportunity to save on the latest disc production equipment. Only of interest to previous Primera customers is the ADL-MAX. This is an aftermarket attachment that will allow Primera Bravo 2 and Bravo Pro users to convert their publisher to a 300 disc load capacity. ADL-MAX has never been a huge seller but in our opinion it’s the perfect add-on to the Primera base unit. We have one left and the product is half price. Do yourself a favour and don’t think for too long about buying this item since it will likely sell quickly. Thanks to StorDigital, DVD video Pirates are a dying breed. 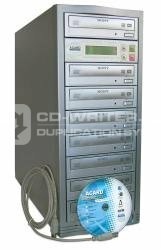 We recently introduced a tower duplicator that enables discs with DVD Video copy protection. 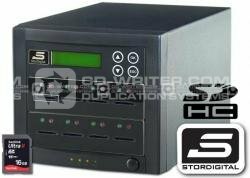 The StorDigital SafeTower comes with hard drive, copy connect and copy protect features that require a PC for operation. 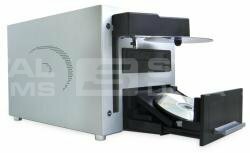 Using a combination of hardware and software the SafeTower effectively protects DVD Video discs from unlawful duplication and ripping. It’s a very neat feature that will appeal to original content producers who wish to protect their assets. Make More from your Media with CD-writer.com. Last of the USA Bravo Pro stock … Shame, great product, fantastic price! 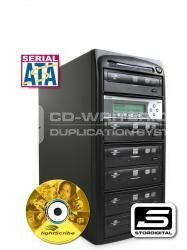 In the past CD-writer.com was well known for selling Primera product sourced from the US of A. In fact over the years we have sold 100’s of Bravo product sourced via the USA channel. Since sterling is no longer so strong against the dollar we can no longer afford to bring you great savings on USA product. However, one lucky person will get our last ever Bravo Pro unit at a hugely discounted price. 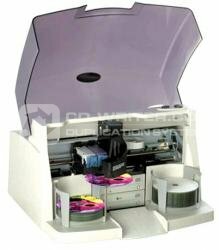 The unit has a full manufacturer warranty supported by a 1 years warranty from CD-writer.com Ltd. The price of this product speaks for itself. One unit ONLY so don’t delay. These printers are fantastic and we use the daily in our offices. Here we have 2 units of the best automated inkjet printer on the market. This device is not only a printer but also a PC running XP. What’s more the unit features hot swappable printers so it can be used for printing via inkjet, monochrome thermal or full colour thermal depending on which printer you have installed. The units we have on offer here feature inkjet printers from HP and use the lowest cost inks on the market. We use these very same models internally at CD-writer.com to produce jobs for our customer. The build quality is so high and the software so powerful that no other printer in the market place can compete. So to summarise, here’s a chance to buy a professional industry leading automated inkjet disc printer, with an embedded PC and network ready, using and HP print engine with 300 disc capacity. The MF Digital prinstation has the power to revolutionise your disc production facility. We only have 2 units and they have a massive discount from list price.